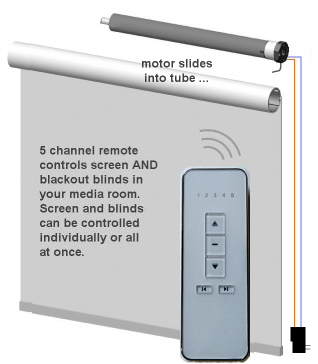 FAQ: Can your blind motors be used for home theater projector screens? Our remote control motors can most certainly be used to make a home theater projector screen. This isn't going to be a long article, because it really is very easy and affordable to make one. I have a pretty nice setup, with my 12 ft motorized screen, my 2800w high power projector with 3 LCD 1080p Epson® engine, and my 300 watt RMS Dolby 7.1 sound system. 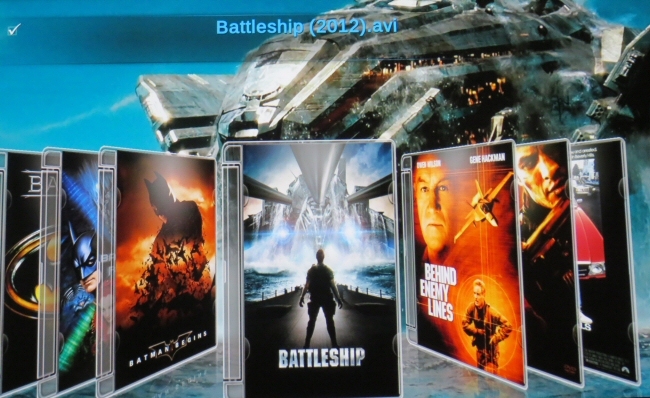 With my LG Blu-ray at the ready, and Netflix streaming from my laptop, it's a pretty nice system that works well for us. We have been asked about this many times, and the other day one of our customers sent us a video of the projector screen that he made, so I thought it would be a good idea to share this story, for all of you out there that have been wondering about how to do it. The projection screen is 11 feet wide and fits nicely in a room that is that wide. Frank got the aluminum at one of the Metal Supermarket™ stores, and the screen fabric from eBay. Our motor kit comes with the brackets and tube ends required to mount it. The 12v power supply is plugged into an AC outlet, and the motor is programmed to respond to one of the 8 channels on the remote (you can control blackout blinds and other devices with the same remote). That is pretty much all there is to it; no rocket science required. In the above video, our customer used Kit#1, but you could also use Kit#10 which uses a wireless battery motor (with solar option). You can even use our Mini tubular motor to retrofit off-the-shelf blinds, from stores like Ikea or Home Depot. With our Z-wave interface and Vera, or other home automation systems like Raspberry Pi, HomeSeer, or Event Ghost, you can control your Rollertrol™ motors and other devices with your phone, tablet or PC, while at home or away! In the 'Ultimate Home Theater' article, you can see how our senior design engineer used our motorized curtain closer/opener kit. Another notable use of our motors was for his blackout blinds on the side windows. A simple modification on the vertical window frame sides with u-channel attached by double sided tape provided a very effective blackout system. We have had so many people ask about this, we have published a new 'how to' article about implementing blackout blinds. We sincerely hope you enjoy using our advanced motors in your projects; if you have any questions, please feel free to contact us at any time!